Mountain Home Road is open but may be impassable due to standing water on the road near the parking area for the Preserve. Trail system is rough due to forest thinning operation on the property, and likely very muddy in places. Repairs will be done in spring and summer of 2019. This is a great area where you can make your trip as short or as long as you like. The main loop follows Mountain Home Road to the top of a saddle and has great views of Wedge Mountain and the Enchantments. The network of old roads and trails on the Mountain Home Ridge property makes it a great spot to hike, bike, or ride a horse. The wildflowers and song birds are incredible and the views views looking up the Icicle and down on the valley from the ridge are unbeatable. Directions to the property: From Highway 2 near Safeway in Leavenworth, turn southwest onto East Leavenworth Road. In about 500 feet, take your first left onto Mountain Home Road. In 3.5 miles, you will see a sign indicating the end of the county road, and there will be a large pull out on the right side of the road – park in the pull out. The Mountain Home Ridge property is on the left side of the road. Enter the property by the old road that takes off to the east. The road is gated and property signs near the gate will let you know you are in the correct place. A quick out and back all on old roads with great views towards Peshastin. From the bottom, stay right at the first road junction (.33 miles in) and in 250 feet, take the left fork at the second road junction. Follow this road 0.66 miles to the view point. 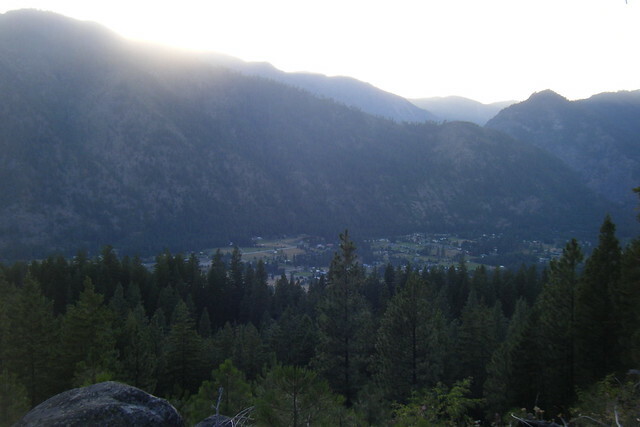 This route offers amazing views of the city of Leavenworth. From the bottom, stay right at the first road junction (.33 miles in) and in 250 feet, take the right fork at the second road junction. In another 0.3 miles, there is a small pull out to the right of the road and a trail takes off west from there. Follow this single track to the top of the ridge. After 3/4th of a mile, take the trail on the left heading south. In 0.1 miles, you will intersect the Canyon Crest Trail on your left. This route passes a wetland that offers exceptional birding and plant diversity. From the bottom, stay right at the first road junction (.33 miles in) and in 250 feet, take the right fork at the second road junction. Stay on the road as it narrows into a single track trail. In 1.1 miles, you will intersect the Rat Creek Ridge Trail.